Thank you so much Alison! As soon as I have the release days, I’ll be shouting it from the roof top! My editor has been so swamped over the past couple of months. 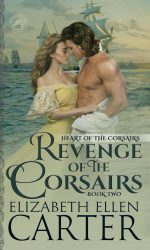 You might be interested in a new feature I’m about to launch mid-December – an online magazine which has a first person interview with the heroine of Revenge of the Corsairs. Thank you so much! I hope you enjoy Captive of the Corsairs. The hero, Kit Hardacre, is such a great character to write.